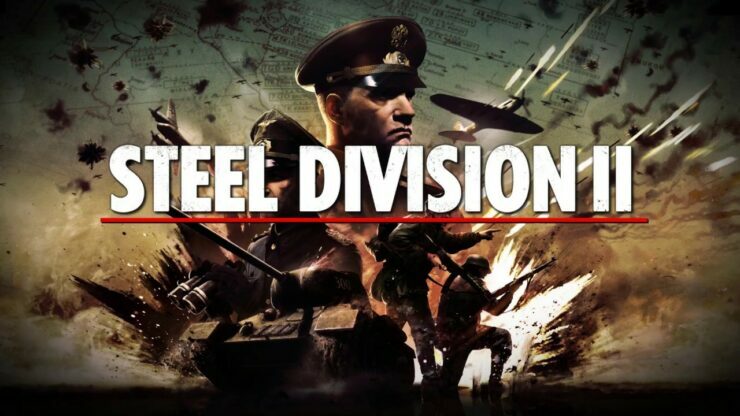 Steel Division 2 is the sequel to one of my top strategy titles of recent times, developed by what are now veterans of the genre in Eugen Systems. My history with Eugen Systems started with Act of War, a drastically underrated game. Then came R.U.S.E., the Wargame franchise and of course Steel Division – one of 2017’s best strategy games. My expectations for Steel Division 2 were always going to be high, so my chance to see it at Gamescom was a great chance for the game to grab my interest. As my preview would indicate, it certainly managed that. The thing then is simple, is this a game I’d preorder? That’s a strange question because normally my answer to “will you preorder this?” is a simple one: No. Why? Because I don’t preorder a game unless it’s going to be scarce. No digital game can be scarce by the nature of it being digital. That’s a discussion for another time anyway. We’re here to look at the pre-order trailer of Steel Division 2, a game I’m thoroughly looking forward to, and the bonuses it offers if you were to preorder it. 2 Exclusive Aces − An Ace is a famous and successful military professional who has accomplished remarkable feats, such as number of aircraft shot down or a number of successful sniper shots. In terms of gameplay, an Ace is a cosmetic model that replaces an existing unit in the game. It has the exact same characteristics as the unit it replaces and will not offer any pay-to-win advantages. Players who pre-order Steel Division 2 can look forward to receiving Ace Ivan Nikitovich Kozhedub with his La-5FN “14” fighter aircraft, the “Ace of Aces” – and Ace Ludwig Neigle with his Nashorn tank destroyer. 2 Exclusive Camos − A Camo is a military camouflage skin applied on units. In Steel Division 2, Camos are military themed and designed with historical authenticity in mind. Players who pre-order Steel Division 2 can expect two exclusive Camos to customize units. 2 Exclusive Wallpapers − Update your desktops with two exclusive wallpapers, featuring unforgettable moments inspired by heroic moments featured in Steel Division 2. The game also has two extra editions that will be released. These are the Commander Deluxe Edition and also the Total Conflict Edition. All of the bonuses can be seen above. The Commander Deluxe Edition simply gains the Commander Pack without the History Pass. From what I saw of the game, I have to admit I’m genuinely interested in the Total Conflict Edition, especially if the three additional campaigns will be as large as what the one included in the base game appears to be. For now, we don’t know for sure. 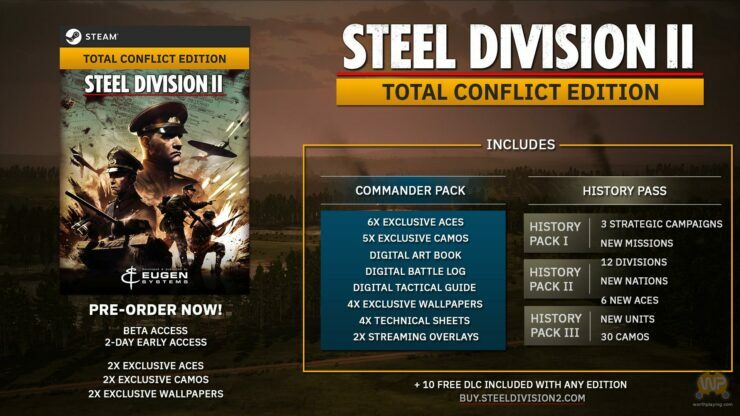 If you’re interested in pre-ordering Steel Division 2, you can do so over at the official site, Humble Store and Gamesplanet. Steam and Amazon versions are to come later.